Heavy duty and well made furniture. 8' x 40'' Antique Rustic Folding Farm Table and Four Bench Set. Seats 8-10. Rustic furniture is unique and may very in color and consistency. Please reserve very quickly. Limited availability. This is a very popular rental item. 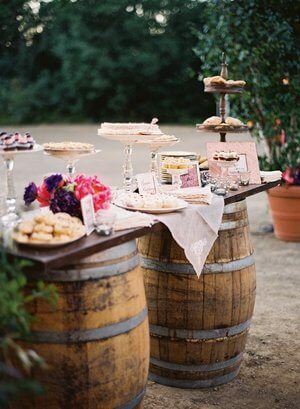 Barrel tables are great for any style wedding or event. 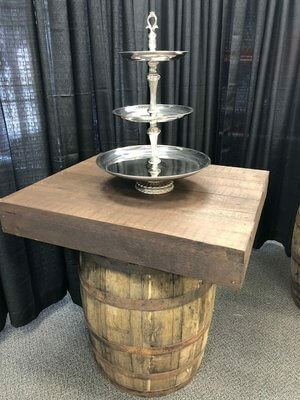 They are great as stand alone cocktail tables and can be spread throughout the event. The double barrel tables are great for buffets and bar service. The barrels are unique and may be slightly different than shown. Please reserve very quickly. Limited inventory. This is a very popular rental item. No rustic event is complete until you get Mason Jars! !